If you’re new to the global Church, you can easily view worship as something we do on Sunday mornings. Worship, to you, may be singing songs with people in the church. Worship may be what you see people do with their hands raised. This is all worship, but that’s not the definition of worship. Let’s look at what worship really means. reverent honor and homage paid to God or a sacred personage, or toany object regarded as sacred. 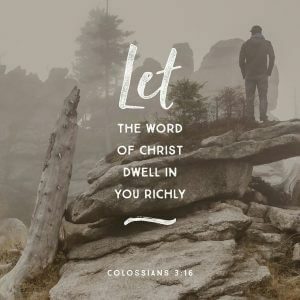 In Colossians 3:16: 16 Let the message about Christ, in all its richness, fill your lives. Teach and counsel each other with all the wisdom he gives. Sing psalms and hymns and spiritual songs to God with thankful hearts. In Acts 16:25: 25 Around midnight Paul and Silas were praying and singing hymns to God, and the other prisoners were listening. 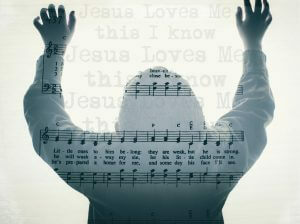 Life application: Sing praises in His name. Participate in the music of your church, even if you have no musical ability. As Psalms 100:1 says, Make a Joyful noise! Singing to our God is an important part of worship. We have to remember that it is only a part, though. Let’s look at 4 other areas in your life that can be devoted to worshipping our God. Prayer is ESSENTIAL in the Christian life. Prayer is communication with God. With prayer, we present our requests to Him and listen for His answer. Prayer is a start of a two-way communication. Through prayer, we receive wisdom, discernment, patience, and things asked for in His spirit. The Bible calls our attention to prayer several times. If we are constantly praying, we are constantly in worship. We are also constantly in direct communication with God. 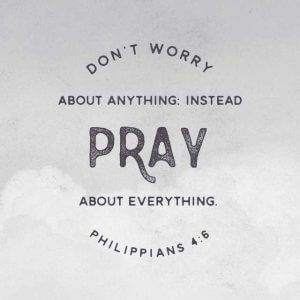 Don’t be anxious, but pray:One of my favorite verses in the Bible is from Philippians. It’s one of the first verses that I memorized in my early walk with Christ. Philippians 4:6-7 is where you can find it. I love to think about the peace of Christ just entering and covering my life because of prayer. I use this to get through a lot of tough times. That and the song by Casting Crowns, Praise You In This Storm. Life application: Make a conscious effort to pray as soon as you get up, before each activity you start, before each meal, and before bed. When you are up for a decision, go to God before you go to anyone else. This is the power and importance of prayer. 23 For I pass on to you what I received from the Lord himself. On the night when he was betrayed, the Lord Jesus took some bread 24 and gave thanks to God for it. Then he broke it in pieces and said, “This is my body, which is given for you. [a] Do this in remembrance of me.” 25 In the same way, he took the cup of wine after supper, saying, “This cup is the new covenant between God and his people—an agreement confirmed with my blood. Do this in remembrance of me as often as you drink it.”26 For every time you eat this bread and drink this cup, you are announcing the Lord’s death until he comes again. I like to take it a step further and think about everything I eat and drink as coming from Him. That’s part of my prayer life as well as my communion life. Matt Redman remade a song called Nothing But the Blood. It reminds us that His blood makes us whole. Life Application: Remember. Don’t take God’s provisions for granted. Give yourself completely in the sacrament of communion. If you are like me, studying ANYTHING is a chore. But let’s think about how we approach things in life. When we see that viral video on Facebook or Youtube, we want to know more about it. We share it with our friends and family. If you are interested in voting, you find about at least a little something about your candidate, right? What about your spouse or significant other? When you show interest in them, you ask about their hobbies, favorite foods, and things about their past or family. We want to get to know more about them, their plans, and how we can fit into their lives. This is exactly what we do when we study the Bible. We get to know more about God, his Will, and all His family. We find out how the Old Testament and New Testament are all one continuous part of God’s plan. We find out how we can fit into that plan and how we can transform ourselves into the true image He wants us to be. This passage is reminding us that we are set apart from the world. We renew our minds with scripture and, in turn, are transformed. This brings us to know His Will better. Study materials, including Bibles, commentaries, devotionals, and other books are available at our Resource Store. Life Application: Try to study the Bible as much as you study your favorite singer, actor, or YouTube channel. Know that studying God’s word is worshiping God with your mind. 16 Now regarding your question about the money being collected for God’s people in Jerusalem. You should follow the same procedure I gave to the churches in Galatia. 2 On the first day of each week, you should each put aside a portion of the money you have earned…. We should all strive to arrive at a point in our faith where giving is about trust. In addition to the church, giving can be to charities like Children’s Hope Chest, radio stations like KLove, or other ministries out there. When it comes to money, we must trust that the Lord will provide (as we pray for it in the Lord’s Prayer). We should also give our time and talent freely and with joy. If we aren’t doing it in this attitude, then we have to examine our purpose and pray about it. God will help us get there if we ask Him. Life Application: Grow in your faith till the point that giving of your time, talent, and money is a joyful act of worship. Pray to God for guidance in this area. Worship is more than Sunday mornings. We can see that there are many areas of our lives that we can re-think and re-gear towards worship. Putting everything together will make worship an everyday part of our lives. What have been your best worship experiences of your life? What can you tell others about what worship means to you? Please comment below. It helps the site a lot! If you know someone who would benefit from this post, please share on Facebook here or to your favorite social media by clicking the links on the side of the page. Thank you so much and God Bless you.